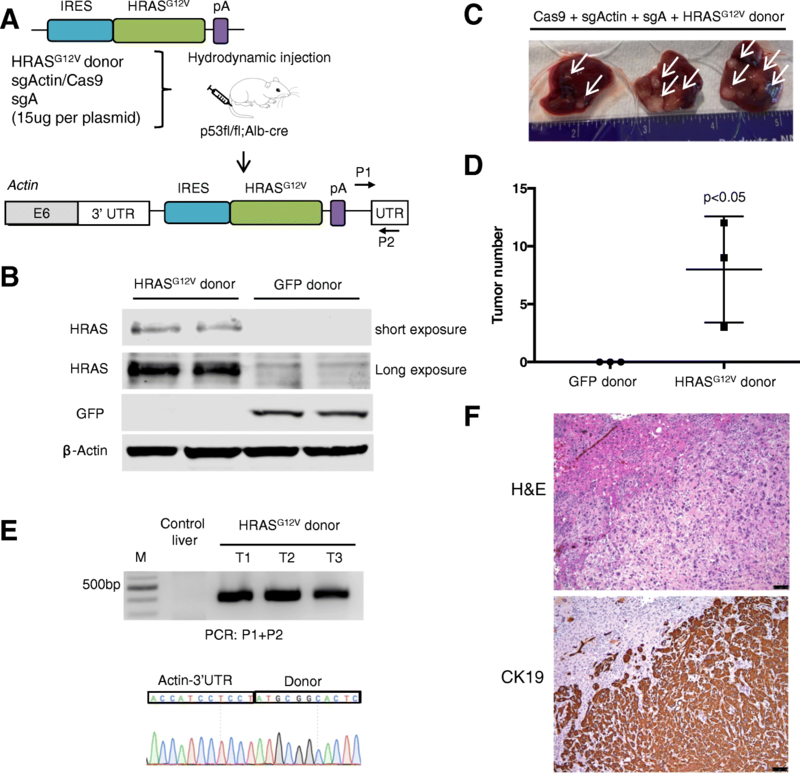 Previously, we and others showed CRISPR/Cas9 could be employed to generate loss-of-function mutations in tumor suppressor genes, making in vivo cancer studies more efficient [4–11]. Gain-of-function alleles can also be made by CRISPR/Cas9 and HDR donor [5, 12, 13]. 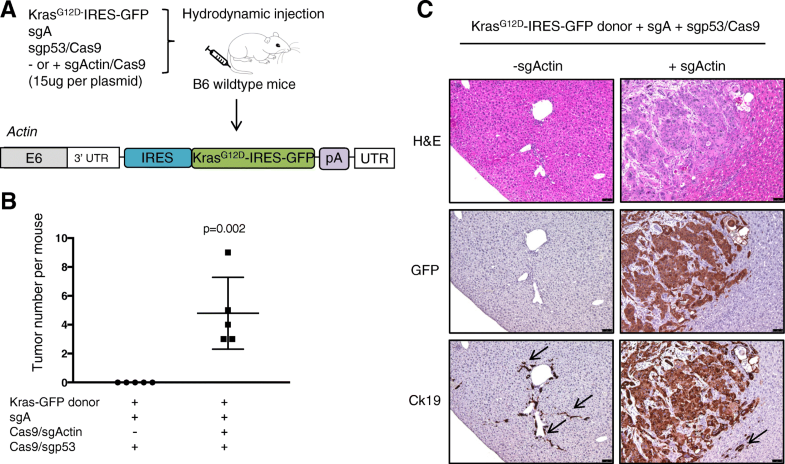 However, the low efficiency of HDR-based gene knock-in presents a significant hurdle for researchers aiming to model in vivo gain-of-function mutations in oncogenes. While the overall cancer death rate continues to decline, cancer is still the number two cause of death nationally, in part, due to our limited understanding of the underlying biology of many cancer types. New methods of rapid in vivo modeling are needed to understand cancer biology. Liver cancer is a major cancer type with poor prognosis [14, 15]. Specifically, liver cancer incidence in the USA has tripled in the last 40 years, and liver cancer deaths have been increasing since 2000 . 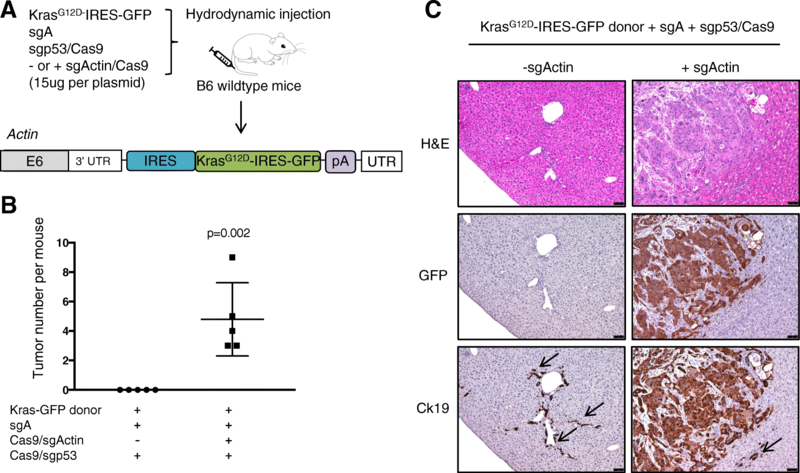 Transposon-mediated integration utilizing sleeping beauty system is an established way to study multiple gain of function of oncogenes in the liver [17–19]. Although transposons are powerful genetic tools, it is difficult to control the integration site and copy number. 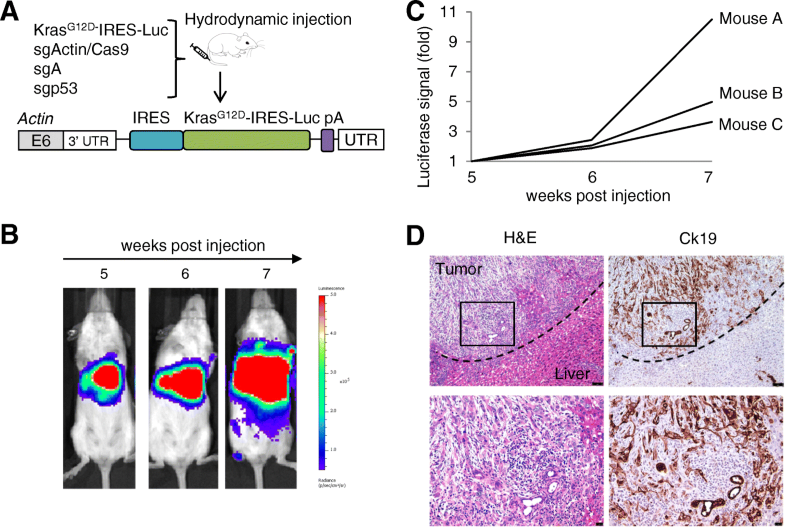 Thus, a rapid and precise method allowing a greater degree of targeted somatic oncogene knock-in is needed for liver cancer. Recent studies have demonstrated that homology-independent pathways can be utilized to insert large sequences in vivo [20–22]. Two guide RNAs make knock-in feasible: one guide RNA targets the genomic insertion locus, and the other linearizes the non-homologous plasmid template containing the desired sequence for integration. A similar strategy using 28 bp microhomology arms has also been reported . Although CRISPR/Cas9 can facilitate the integration of large DNA sequences into a target locus and is applicable for human cells [20–22], a flexible in vivo gene knock-in method has not been established for cancer mouse models. To knock-in desired sequences, we chose the β-actin locus because it is robustly expressed in most mouse cell types and organs . We first designed a guide RNA targeting the 3′-UTR of β-actin locus. We also adopted a published donor plasmid containing IRES (Internal Ribosome Entry Site) sequence to express gene of interest (GOI) and an sgRNA (named sgA) to linearize the circular plasmid donor . We then designed a strategy to flexibly clone any GOI sequence into the donor plasmid (Additional file 1: Figure S1). In this CRISPR-SONIC system, knock-in occurs in three steps: (1) Cas9 and sgActin cuts the 3′-UTR of β-actin; (2) Cas9 and sgA linearizes the donor plasmid; (3) linearized donor is inserted in the 3′-UTR of β-actin through NHEJ. If insertion occurs in the correct orientation, expression of the GOI will be driven by the endogenous β-actin promoter and the IRES signal respectively (Fig. 1a). Finally, the poly A signal ensures transcription termination after the GOI. Following in vitro validation of our editing strategy, we then tested our strategy in vivo. 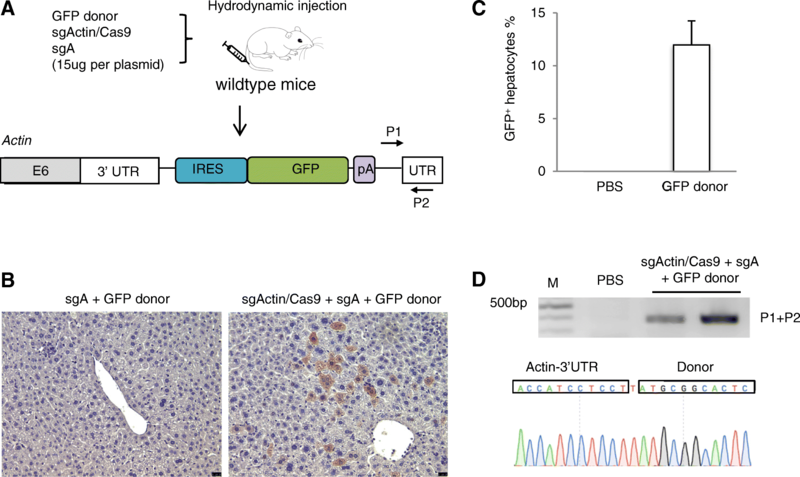 We used hydrodynamic tail-vein injection to deliver CRISPR-SONIC to mouse hepatocytes [17–19]. 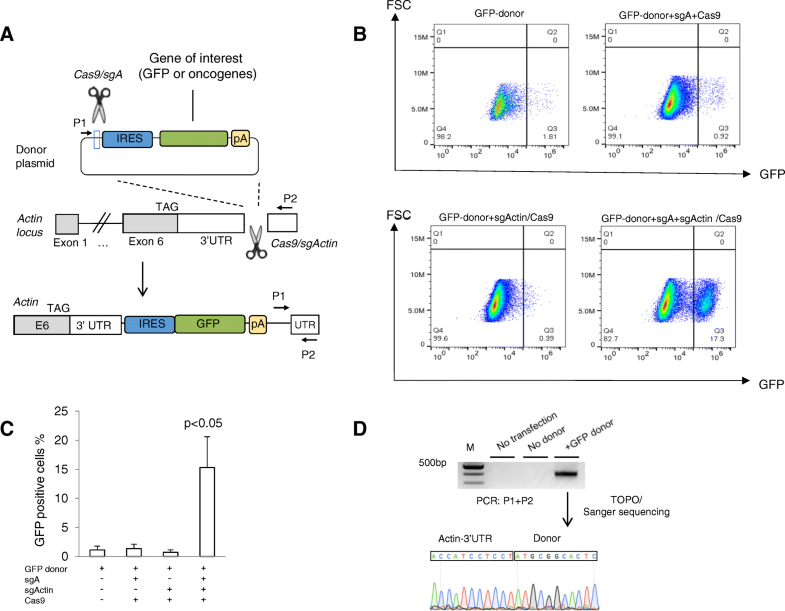 We again used sgActin/Cas9, sgA, and the GFP donor plasmids for targeted integration (Fig. 2a). Seven days after hydrodynamic injection, mice (n = 3) were sacrificed for liver tissue collection. By immunohistochemistry (IHC) staining, we detected 12.0 ± 2.3% GFP-positive hepatocytes in vivo (p < 0.05 compared to control group) (Fig. 2b, c). Next, we confirmed IRES-GFP sequence integration at the target locus through PCR detection of the expected band and subsequent Sanger sequencing of the amplicon (Fig. 2d). Finally, to better characterize the tumors, we collected tumor tissue for histologic analyses. Using IHC, we observed that tumors are positive for the primary ICC marker, cytokeratin 19 (Ck19) (Fig. 3f) [35–38].